The City of Kansas City, Mo., is partnering with Kansas City Power & Light and Mark One Electric to install solar panels on the east side of the City Market, one of the largest public farmers markets in the Midwest. 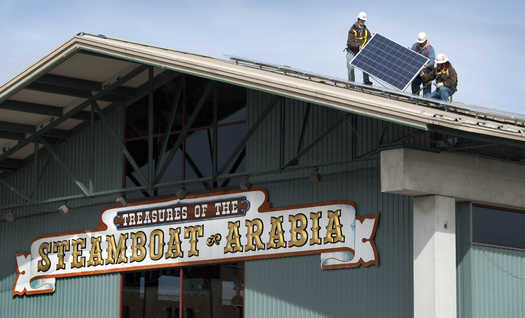 Two 25-kw solar systems are being installed on the south-facing roof peak of the Arabia Steamboat Museum. Each system comprises 100-250 watt modules. The systems were designed by Solar Design Studio for KCP&L and are leased to the City. Panel installation by Mark One Electric will be completed this month, and the system will be fully operational by late spring. The market is one of 65 City locations to receive solar installations as part of the City’s plan to install solar panels on City-owned buildings, making Kansas City the largest user of on-site generated solar power in the State of Missouri and the largest municipal user of solar-generated electricity in municipal operations in the four-state area (Missouri, Kansas, Iowa and Nebraska) of U.S. EPA Region 7. The new panels will reduce the amount of generated energy needed to power the market’s east bank of buildings, providing a significant savings in electricity costs and making Kansas City one of the top cities in the U.S. to use solar power rooftop systems. The City Market is a natural model of sustainably by ensuring that food items are transported over shorter distances, processed locally and sold directly to consumers. Additionally, the market has implemented a series of environmentally-friendly projects, including a compost and recycling program that annually diverts almost 400 tons of food waste, cardboard and other materials from local landfills. For information about citywide sustainability efforts, see kcmo.gov/kcgreen. Awesome to see the city investing in sustainable energy!